Every Women's Lightweight Synchilla Snap-T Pullover is made with your comfort in mind. However you choose to wear it, you can feel prepared to face chilly days. 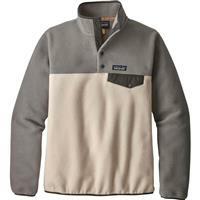 The soft yet long-lasting polyester fleece and four-snap placket let you stay warm but not too hot. If it's a little chillier with some wind, go ahead and snap it up to protect yourself from the elements. If you're moving around more, you can leave them open to stay cool. 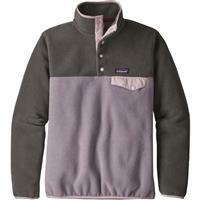 Keep your hands from feeling chilled and your valuables safe in the pullover's pockets. Knowing that you'll feel great wearing one, the variety of colors and patterns available will have you looking great, too. There's a spandex contrast band along the cuffs and hem, giving it a classic look. You're sure to find a sweater that fits your own tastes and style. 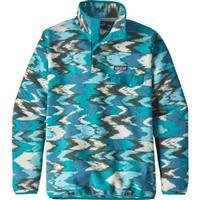 Once you try the Lightweight Synchilla Snap-T Pullover, it may be hard to have just one in your wardrobe! I wear this almost every day in the winter. It's stylish and comfortable at the same time. 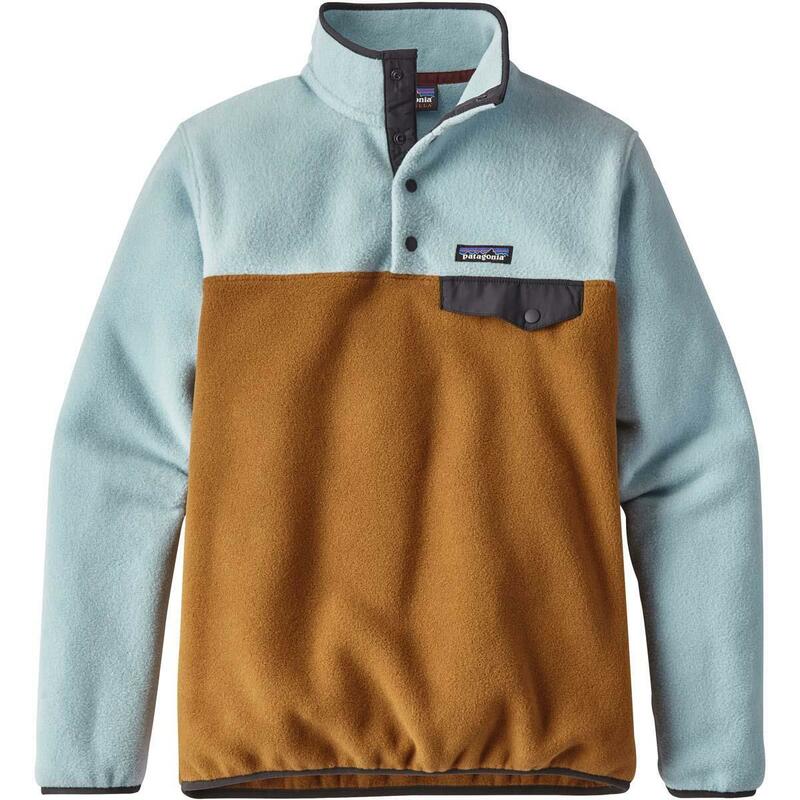 Super comfy, warm, and great for a fall day. 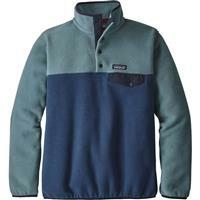 I love this fleece, comes in so many different patterns and colors. It's hard to not just have one of these... that's why I have four! Love the crazy patterns to add a pop of color to snowboots and jeans after the lodge. I love the feel and warmth of this pull over, however the seam that goes directly across the chest is misplaced and awkward. This was not designed with a woman's body in mind. It's very unflattering. 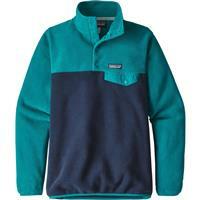 I do however own a few different styles of this pullover, because of how comfortable and warm it is. 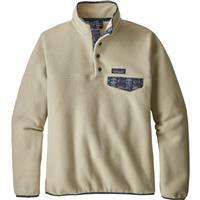 It is not, though a pullover i would wear outside of being active, due to the cut. Can you just choose One??? Pros: can wear as an outer or under layer...with clothes or just lounging around! 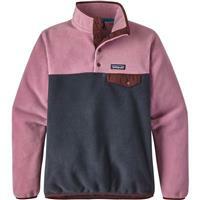 I love this fleece so much I wear it all the time and you can wear it when its cool or super cold. Great item to wear out or just for lounging around. Super warm but perfect for cool fall days. Great sweater to wear on cooler fall days. Very warm and great fit. No need for a jacket with this sweater. The colors and patterns are great and eye catching. WARM WARM WARM. 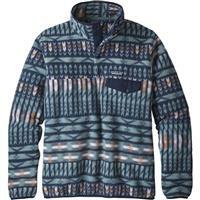 Out of all my Patagonia pieces this is the warmest that I own. I have an Aztec patterned one that I get compliments on everywhere I go because the colors are very rich. I wear this on the coldest days over a long sleeve shirt and I am comfortable. It tends to fit a little looser to allow room for layers. Great for fall and early spring. Washes well and holds up to years of wear. Never goes out of style. Great piece to put on over a basic t-shirt when the weather starts to turn! These come in tons of fun colorful prints! 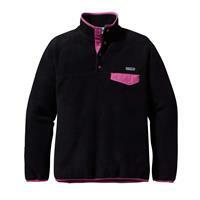 I love this fleece! This time of year (fall) I live in it. Perfect for running errands with jeans and sneakers or just hanging at home in your sweats. I buy new one every year. They last forever and wash very well!! I have two I love it so much! I have 2 of the regular snap-t's and I was so happy with them that I bought a synchilla snap-t as well. I have a patterned one and although it is a busy print it is so much fun! It's nice to switch things up a bit with this synchilla snap-t. It provides comfort and warmth whenever I need it.